In today's political climate, Islam is viewed in increasingly sinister terms. Extremist. Terrorist. Fundamentalist. Alarm over the supposedly growing radicalization of Muslims stateside, fueled by al-Qaeda operatives targeting Muslim American youth, is behind a controversial congressional hearing this week. Supporters of the Muslim-focused hearing, scheduled for Thursday by Rep. Peter King (R-N.Y.), say that it's necessary to understand the threat among us. For many African Americans, however, Muslims are familiar members of the community, devoid of much of these menacing overtones. According to the Pew Research Center (pdf), African Americans make up 20 percent of Muslims in the United States, and nearly 60 percent of converts to Islam. 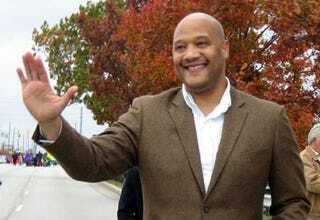 "Muslims, particularly from the black experience, have been here from the inception of this country," said Rep. Andre Carson (D-Ind.) in an interview with The Root. "We had people brought here on slave ships who practiced Islam. Given the continual presence of Islam in our community — particularly emerging from the 1920s and '30s on to the present day — most African Americans have a friend who's a Muslim, a relative, a cousin, a sister or a neighbor. Out of that, coupled with our history of discrimination, I think African Americans have a different sensitivity as it relates to religious and racial profiling." As one of two Muslims serving in the U.S. Congress, the other being Rep. Keith Ellison (D-Minn.), Carson has an even further heightened sensitivity to Islamophobia. "I'm deeply troubled by much of the rhetoric surrounding these hearings," Carson said of remarks from King, such as his belief that more than 80 percent of mosques are controlled by radical imams. "Targeting Muslim Americans, as these hearings do, harkens back to the era of McCarthy, when similar witch hunts failed to improve our overall national security and distracted Americans from more pressing issues confronting the nation." To bolster his claim that radicalized Muslims pose a grave threat in our midst, King has referenced the high-profile incidents of Major Nidal Malik Hassan, a military psychiatrist who killed 13 people in a 2009 shooting at Fort Hood, Texas; and Faisal Shahzad, a Connecticut man who attempted to detonate a bomb in New York's Times Square last summer. In light of these incidents, I asked Carson whether some of the concerns are valid. Carson concedes that radicalization in America is indeed an issue that ought to be investigated — but says that Muslims should not be the primary focus of such an investigation. "For one, those incidents are not an accurate depiction of the millions of peace-loving Muslims across this country," he said. "And I could point to many other acts of domestic terrorism — acts by Timothy McVeigh, the Ku Klux Klan, and the numerous neo-Nazi organizations across this country that are actively training for race wars." Carson cites a 2010 report by the National Consortium for Terrorism and Response to Terrorism (pdf) that ranked the country's greatest domestic terrorism threats, as reported by law enforcement officials. Islamic extremism didn't crack the top 10. Instead it fell at number 11, well below militia patriot groups, Christian identity movements and Neo-Nazis. "Terrorism in this country has an Islamic face [for many people]," said Carson. "The truth of the matter is the greater and growing threat to our internal security is coming from organizations that have no affiliation to the religion of Islam." Beyond questions of stereotypes and religious profiling, Carson argues that the hearing may have an adverse impact on national security. "These hearings can subjugate Muslims to increased levels of hostility, xenophobia, and racial and religious prejudices that would discourage them from cooperating with law enforcement," said Carson, pointing out that seven out of the last 10 al-Qaida plots threatening the U.S. since 9/11 have been prevented with the help of Muslims. "What we need is engagement with the Muslim community because if not, it will jeopardize and threaten our internal security." Caron hopes that pro-Muslim rallies, such as the interfaith protest in Times Square spearheaded by Russell Simmons over the weekend, will continue across the country. "Once that happens, I think the Peter Kings of the world will see that their efforts to increase their national profile, by isolating a certain group of fellow Americans, will be undermined quite effectively by the pushback." Cynthia Gordy is the Washington reporter for The Root. Follow her on Twitter.